I went with the Christmas edition of the Cheerz Box, the only difference being extra fancy packaging with a geometric print and hand-tied bow to fit in under the tree - it comes about every festive season but their standard Cheerz Box is out year round in a range of pretty packaged designs. Inside you can tuck 30-45 of your favourite snaps in retro-polaroid style - print wise, the results are awesome, premium photo quality paper is used and the process couldn't be more foolproof: upload, customise, choose your box, send off and wait for the postman to drop it through your door. Simples. My collage is currently adorning my fridge, but I think they'd look pretty sweet arranged in this Memory Frame from The White Company, where I plan to display them next, or even scrapbooked. 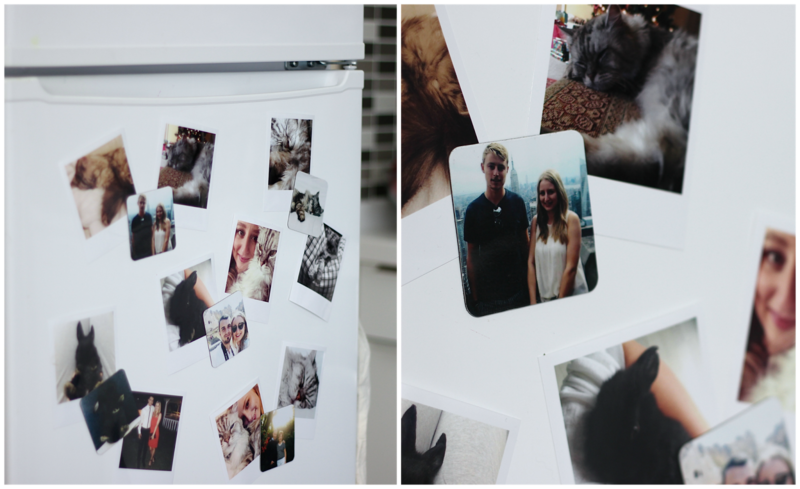 To join them on my fridge and to hold them in their place, I also ordered the Magnets; a box of up to 18 full-photo prints which can be cropped and customised - they pin my polaroids to the door and brighten up my kitchen with some of my favourite snaps (plus it gives me an excuse to hang around the fridge that extra while longer). And that's really about as breezy as it gets - I organised mine online but there's also the Cheerz app which ables to you get it done all in one straight from your phone. I know I'll be capturing some of my favourite moments of 2016, printing them as products and dotting them around my flat to be looked at daily, and if you too want to give it a whirl, you can bag yourself £4 of your first order with the code: JESX91. Happy snapping, and well, Cheerz!